Applications: These holders take non-woven abrasive fleece in either hand pad form, or cut from roll. They help to apply a larger surface to the work-piece enabling greater benefit to be obtained from non-woven abrasive fleece. 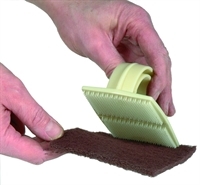 Use for cleaning, rubbing down, preparing for painting and they can even be used as a simple tool for applying graining. Also Available: We stock non-woven abrasive hand pads and abrasive fleece rolls, both of which can be used on these holders.